I hope all of you are enjoying the summer and are looking forward to the school year. You can find in Bus Routes the times of pickup for each student with this year’s bus numbers. We have been working diligently to put this together so you can start planning for the needs of your children. If you are unable to find your address, please call the transportation department at 989-862-8109 so we can answer any questions and make sure your child/children are scheduled on one of O-E’s buses. I am also asking that you have your child/children ride the bus to and from school for the 1st few weeks so they can learn what bus they may have to transfer to in the morning as well as in the afternoon. The transportation department, along with some of the teaching staff and administrators will be at the transfer places to help all the students learn where to go. I would like to assure you that each driver has their student list and not a bus will move until every child is accounted for. It is important to send your child/children on the bus at the beginning of the school year so they become familiar with their new routine, feel confident with their surroundings and in riding the bus. The drivers will also be sending home with the children a few papers that will need to be filled out so we can keep our records updated. Please be prompt in getting these filled out and back to the drivers. We will also be sending home a transportation hand book. Please review this with your children. 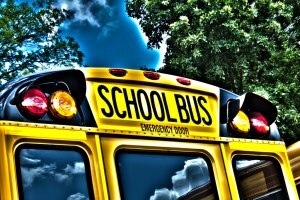 There is pertinent information on bus rules as well as safety and school closing information. Remember to have your children at the bus stop at least five minutes before their scheduled pickup time so as not to miss their bus.